Duke Energy’s history dates back to the early 1900s, and the company is largest electric utility in the country today, serving approximately 7.5 million electric customers and 1.6 million gas customers across the Southeast and Midwest regions of the U.S.
A blend of residential (33%), commercial (30%), industrial (20%), and wholesale (17%) customers make up the company’s mix. Management sold Duke Energy’s international energy business (which was 5% of earnings) in 2016 to reduce the firm’s earnings volatility and focus the company completely on its core domestic operations. The company’s regulated utilities primarily rely on coal and oil (34%), nuclear (34%), and natural gas (28%) for its generation of electricity. Hydro and solar generate another 4% of the company’s total fuel.Duke Energy continues investing in cleaner power generation (e.g. natural gas), which has helped reduce its fuel mix of coal and oil from 61% in 2005 to under 35% today. Many utility companies are essentially government regulated monopolies in the regions they operate in. Aside from in Ohio, all of Duke’s electric utilities operate as sole suppliers within their service territories, for example. Power plants, transmission lines, and distribution networks cost billions of dollars to build and maintain in order to supply customers with power. Therefore, it isn’t economical to have more than one utility supplier in most regions because the base of customers is only so big relative to the investments required to provide them with electricity and gas. Competition is further reduced by state utility commissions, which have varying degrees of power over the companies allowed to construct generating facilities. However, the monopoly status of most regulated utilities has a major downside. The price they can charge for their services is controlled by state commissions. This is done to keep prices reasonable for consumers while providing utility companies with enough of an incentive to earn a reasonable return on their investments made to provide safe and reliable service. As a result, it’s very important to analyze the geographic regions that a utility company operates in. Some states have more favorable demographics (e.g. population growth) and regulatory bodies. Fortunately, Duke Energy operates in generally favorable regions. As you can see, the company has earned a very stable and healthy return on equity between 9% and 11% in each of its regions over the last few years. 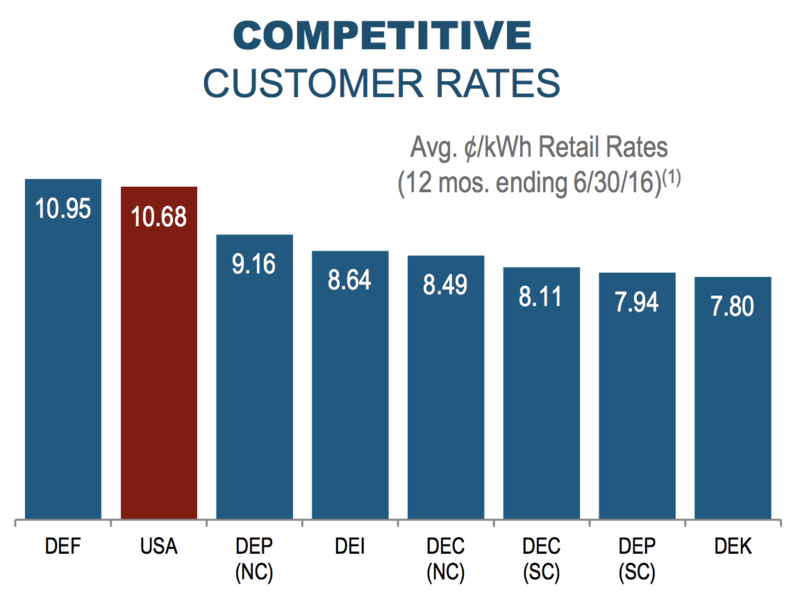 These returns seem likely to remain stable over the coming years, in part because the rates charged to Duke Energy’s customers largely remain well below the nationwide average (only one of the company’s regions, Florida, charges a slightly higher rate). This favorable differential should also make it easier for Duke Energy to win approval for higher rates in the coming years, supporting the returns earned by its ongoing growth projects. 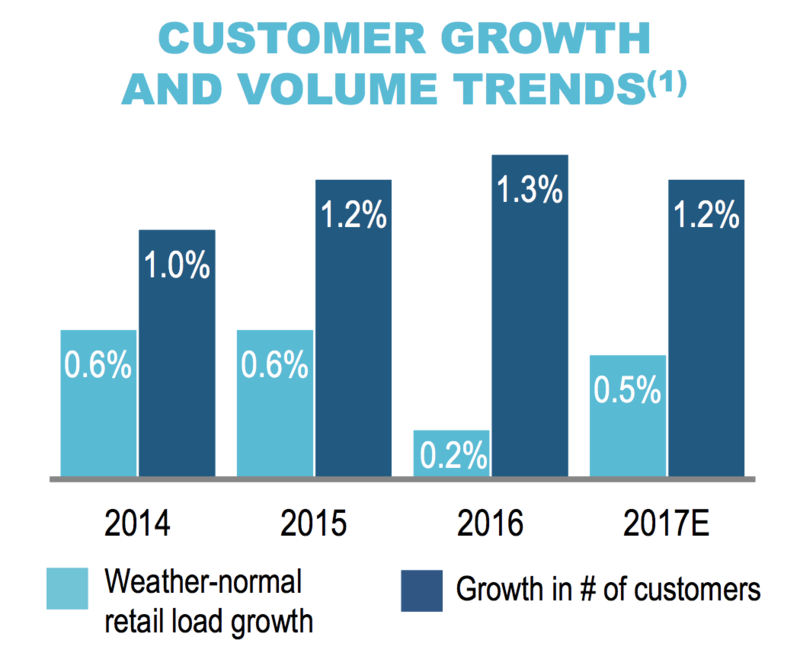 Customer growth also remains positive across the company’s regions, supporting a base level of retail load growth in Duke Energy’s large electric business. Combined with the company’s cost management, this growth has helped support Duke Energy’s return on equity even without significant rate cases since 2013. In addition to the favorable demographics and regulatory frameworks in its core markets, Duke Energy’s business has undergone a rather significant transformation over the last five years to improve the reliability of its earnings and cash flows. Duke Energy’s biggest move was its acquisition of Progress Energy in mid-2012 for over $13 billion, significantly enhancing the company’s scale and market share in regions such as the Carolinas. Duke Energy has realized over $500 million in cost synergies from the deal and become a more efficient energy provider. The company next entered the regulated pipeline business in 2014 to help its efforts to replace coal power plants with cleaner and cheaper natural gas generation facilities. In October 2015, Duke Energy announced a deal to acquire Piedmont Natural Gas for $4.9 billion to boost its push into gas. Piedmont is a regulated gas distribution company that delivers natural gas to customers in the Carolinas and Tennessee. The company roughly tripled the number of customers served by Duke Energy’s natural gas business and owns valuable gas infrastructure that currently supports Duke’s gas-fired generation in the Carolinas. Compared to electricity sales, which seem likely to slow as energy usage becomes increasingly efficient, gas has a much stronger growth profile. This is because new pipelines coming on-line will allow gas to replace dirtier power sources such as coal in regions where gas was previously inaccessible. Piedmont’s operations establish a platform for future growth in gas infrastructure projects and will be further expanded to help with Duke’s ongoing conversion from coal to gas power. In fact, management expects its business mix from natural gas to expand from 8% today to 15% within 10 years. 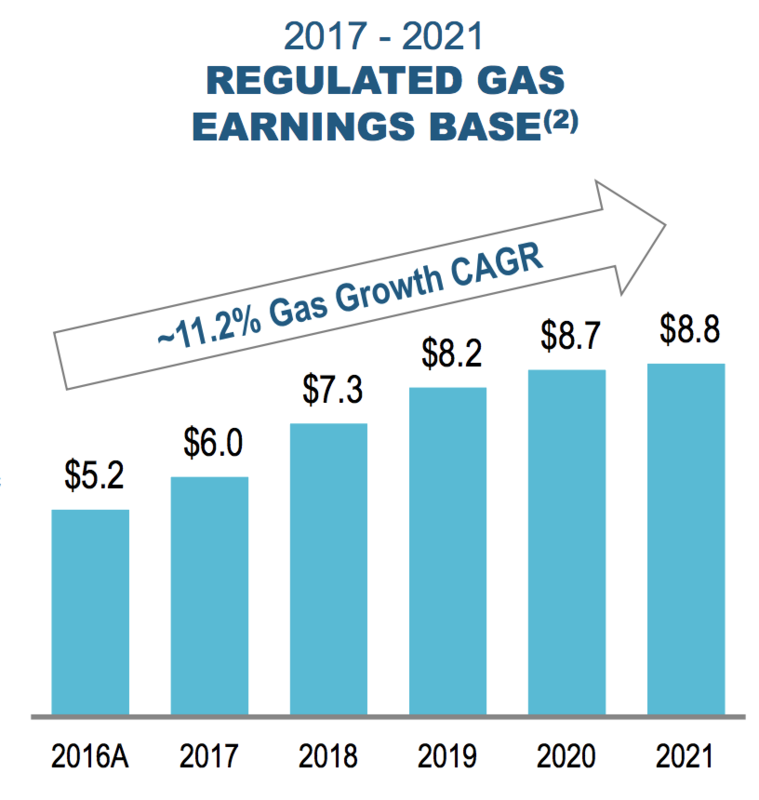 Regulated gas companies also offer strong and predictable returns on capital (Piedmont’s return on equity is about 10%) and should continue to benefit from the natural gas surplus in the U.S., which is driven by low-cost fracking. Besides acquisitions, Duke Energy has disposed of non-strategic assets to lower its risk profile and improve the quality of its earnings. For example, management sold the company’s merchant Midwest commercial generation business to Dynergy for $2.9 billion in early 2015 and sold its struggling international energy business for a couple billion dollars in 2016. Each of these segments had less predictable earnings and greater macro risk compared to the company’s domestic regulated businesses. Duke Energy believes its current business mix is now 100% focused on its core operations, which only accounted for 75% of net income in 2011. Going forward, Duke Energy has more than $35 billion of projects planned through 2021 which are expected to drive 4% to 6% annual earnings growth (and a similar rate of dividend growth). The company has met its long-term annual adjusted diluted earnings per share growth objective of 4% to 6% since 2009, supporting higher confidence behind management’s guidance. 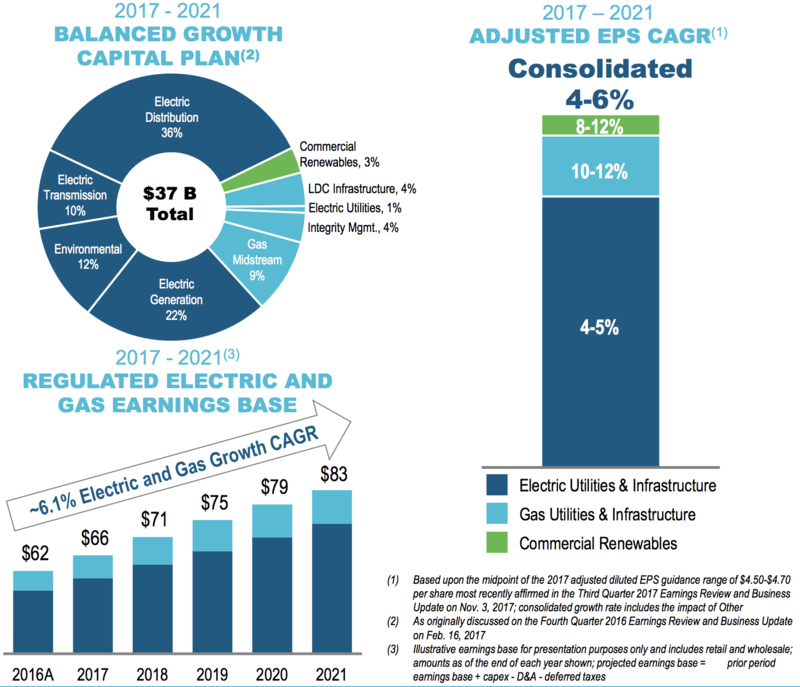 Duke Energy’s earnings growth is also driven by relatively low risk activities – base rate increases, investment riders, major capital projects to modernize the grid, and growth in its gas utilities & infrastructure business. The company’s free cash flow will remain restricted the next few years to fund its $37 billion of growth investments through 2021, forcing it to lean even more on debt and equity markets, but Duke Energy’s investment-grade credit rating and relatively low risk profile should provide it with plenty of access to capital. Overall, Duke Energy appears to have a strong moat and a decent outlook for growth (for a utility). The company has excellent scale as the largest electric utility in the country, owns a portfolio of complementary businesses with numerous growth opportunities, and operates primarily in regions with generally constructive regulatory frameworks and demographic trends. Management has also simplified Duke’s mix to focus on core regulated businesses that provide reliable earnings and new growth opportunities in natural gas and renewable generation resources. While the utility sector is gradually evolving, Duke Energy is likely here to stay for a long time to come. Uncontrollable macro factors, such as mild temperatures and volatile industrial activity, can impact Duke Energy’s near-term financial results. However, these are transitory issues that have little to no bearing on the company’s long-term earnings potential. The bigger risks worth monitoring are changes in state regulations, population growth trends in key states, increased environmental regulations, and execution of the company’s business strategy (e.g. large projects and acquisitions). The rates Duke Energy can charge its customers are decided at the state level. 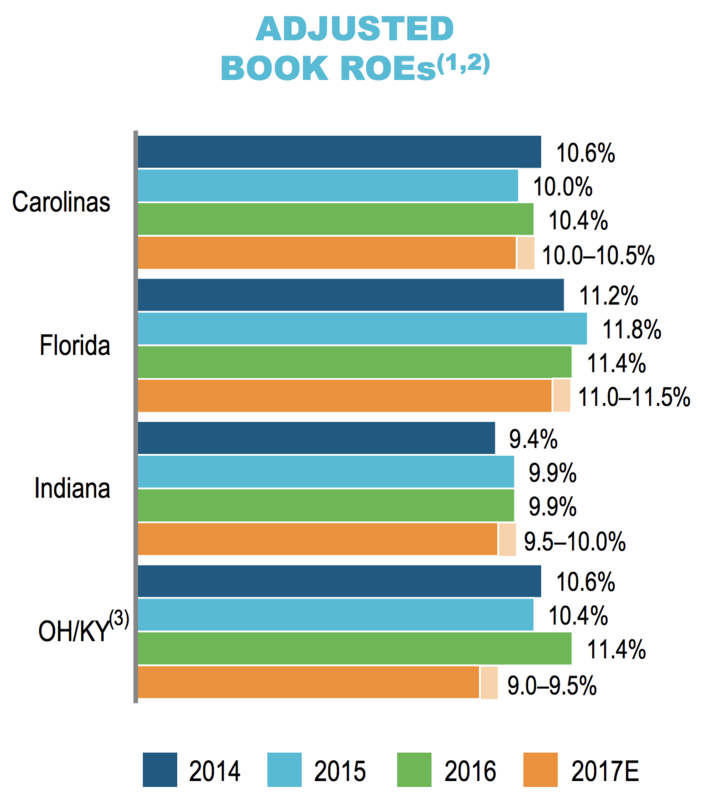 Fortunately, most of the regions Duke Energy operates in have generally favorable regulatory environments and are characterized by positive population and economic growth. However, the company is banking on these conditions remaining stable as it continues investing for growth and depending on states to approve rate increases in order to earn a fair return on its capital-intensive investments. The company will file several rate cases in 2018 but has already reached a constructive settlement with regulators in Florida, providing rate clarity through 2021 in that region. The Environmental Protection Agency (EPA) also creates risk for utility companies in the form of enhanced safety and emissions standards. Duke Energy estimated that its notorious coal ash spill, which took place in North Carolina in 2014, could require cleanup costs in excess of $5 billion over the next few years. The company hopes to pass on these higher costs to ratepayers (an estimated $200 million per year), but regulators may be unwilling to comply. In fact, North Carolina’s attorney general recently asked regulators to deny Duke’s rate hike request and lower the company’s guaranteed profit level from 9.9% to 8.5%.Duke Energy should have the financial strength to survive an unfavorable outcome, but environmental costs can clearly be substantial headwinds. Additionally, over the very long-term, electric utility companies will need to deal with the reality that demand is gradually decaying thanks to increasing energy efficiency and distributed generation (e.g. rooftop solar). Duke has earmarked $1 billion for growth investments in commercial renewables over the next five years, but it’s still a relatively small proportion of the overall business (3% of earnings). The company’s acquisition of Piedmont also helps the company with growth outside of regulated electric utility services. With a track record of paying uninterrupted dividends for more than 90 years, Duke Energy appears to be one of the best utility stocks for safe dividend income. The company’s regulated operations provide predictable earnings, and most of the regions Duke Energy operates in are also characterized by favorable demographics and historically constructive regulatory bodies. While there is some uncertainty from the coal ash spill, as well as longer-term risks such as lower electricity usage trends, the rise of clean renewables, and the company’s major growth investments, Duke Energy seems likely to remain a reliable and appealing income investment in the years ahead. To learn more about Duke Energy’s dividend safety and growth profile, please click here.